How was your September?. Mine was pretty hectic I should say. Preparing to go to India, blogging day and night to schedule posts ahead of time.. Man!. 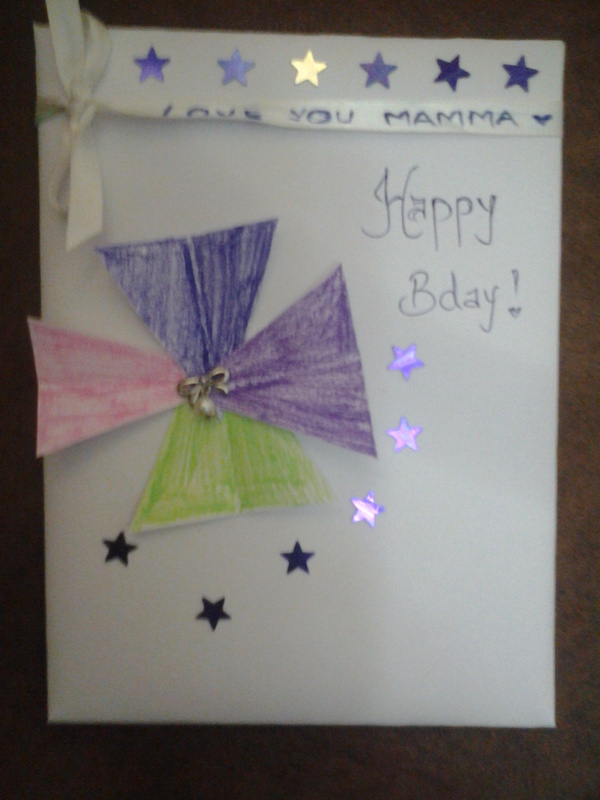 I dunno how I did it :P. It was my husband’s birthday on the 21st and my family came over to celebrate it together. They brought a gorgeous cake too :). 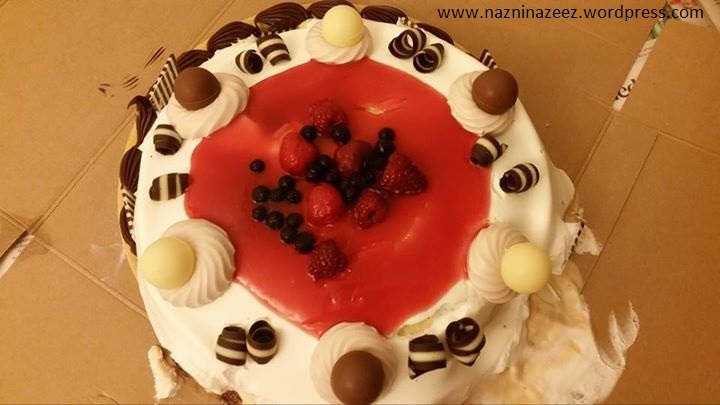 It was the Praline Berry Splendor ice cream cake from Baskin Robbins. Yum! 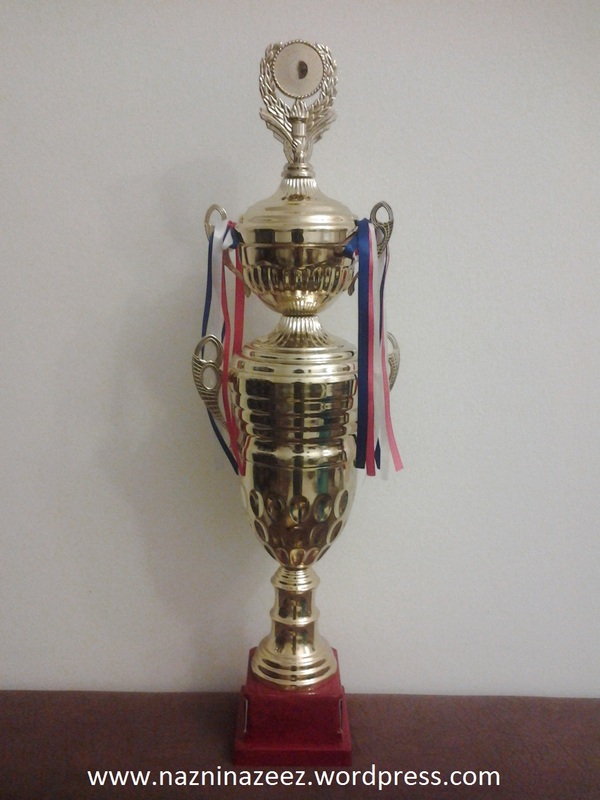 My husband won a cricket tournament and brought home a massive trophy. I just had to share it with you guys. I am way too proud of him right now ♥. Also, kudos to his team for being awesome! 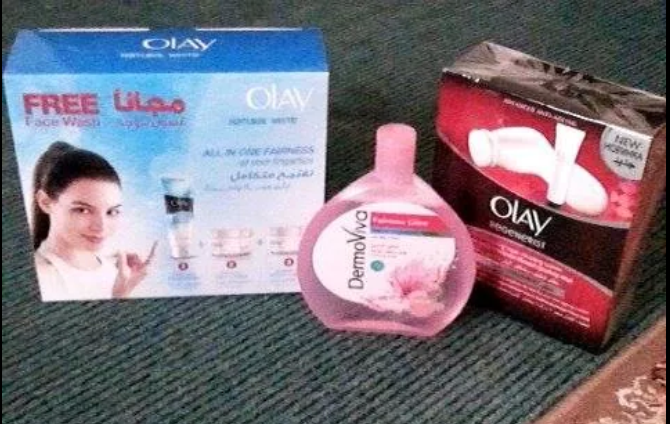 All of these were purchased from Carrefour, Sharjah City Center. 1) Jamie of Some of This and That, did a Swedish meatballs with mushroom cream sauce, which had me drooling over the pix!. It looks really delicious. Do check it out. 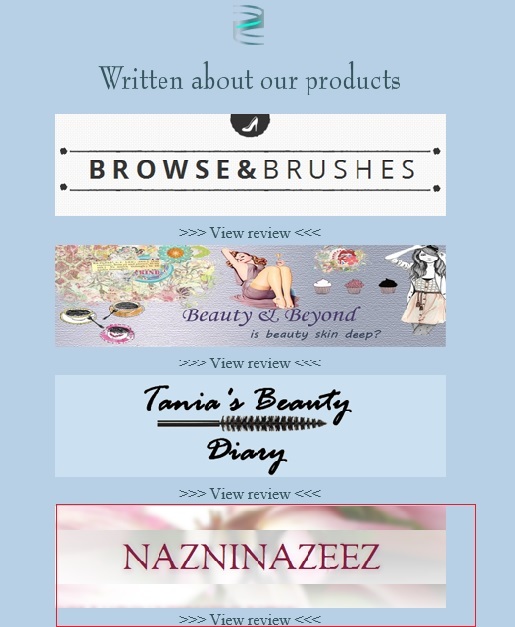 2) Megan of Lush to Blush, has done a very informative post on how WordPress is better than Blogger. I completely agree with her. I have no experience working on Blogger but I have enough and more friends who complain about it. I personally love WordPress so much. It’s so user-friendly. If you are considering whether to move to Wordpress or not, I say, go ahead!. Please do and also check out this awesome post by beautiful Megan..
3) Sarah of Blend N Smack, has done a fierce, step by step Halloween makeup tutorial with a half skull, half glam look, that is just so stunning. It amazes me how talented this young friend of mine is. Gosh!. You have got to check her out, especially since this is just the first of a series of Halloween looks that she is going to create! 4) Abidha of Abidha Ayyoob’s Blog, has done a very helpful post sharing her DIY cleansers for AM and PM. 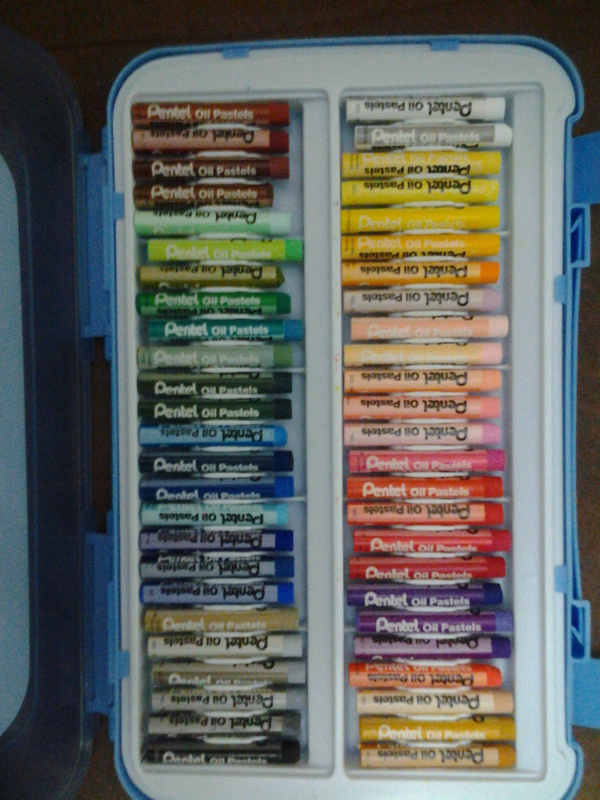 I love DIYs. Natural, homemade things always interests me. I am especially in love with her AM cleanser and hope to try it out soon. Do check out this versatile blogger friend of mine! 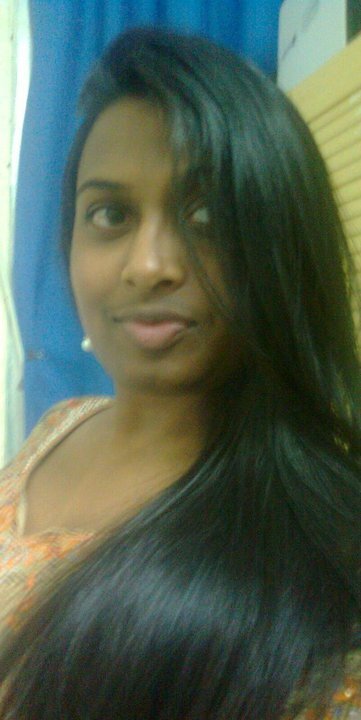 1) Sarah of Blend N Smack, accepted my nomination and did the Lip Product Addict Tag. She also mentioned my own tag post in it. It was lovely reading through your answers, Sarah. Thanks for doing the tag :). 3) Renee of Mother Daughter Book Reviews, did a wrap up post for the Frankie DuPont book and mentioned my review of it, in that post. Thanks Renee! 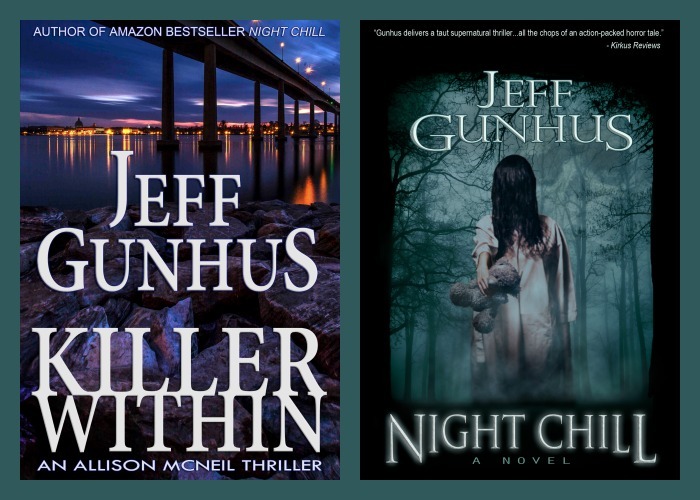 4) Renee also did a wrap up post for two Jeff Gunhus books namely Night Chill and Killer Within and mentioned both my reviews in that post. 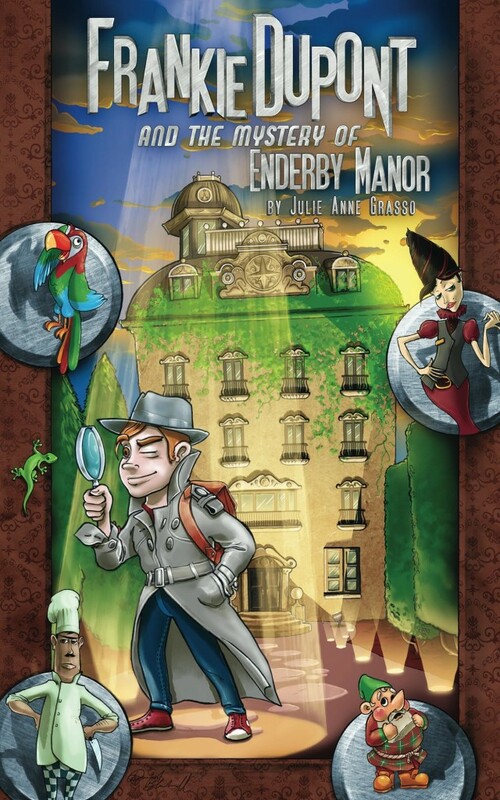 You can read my reviews by clicking here and here. 5) Monica of Pink Asfoura, did a post on things to remember while shopping when there is a sale going on. I thought it was a very interesting post and when I added a tip of mine in the comments, she loved it and updated her post with it, giving credit to me and mentioning my blog :). Thanks, lovely Monica. 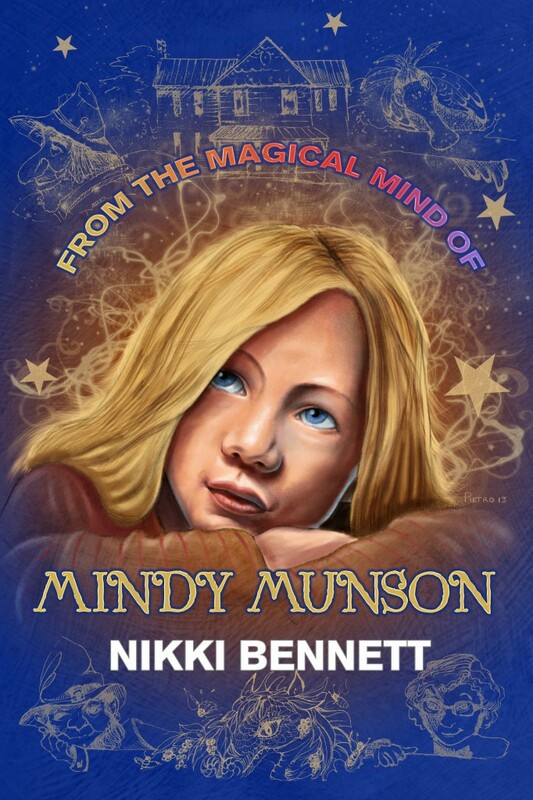 7) Lastly, Renee also did a wrap up post for the book From the Magical Mind of Mindy Munson and mentioned my review of it, in that post :). That’s all for now :). I am super stoked for next month, since it’s my birthday month. I have prepared a pretty good giveaway for you guys. So stay tuned for that!. By the way, next month I will be doing posts every alternate day and not every day like I have been doing since July. 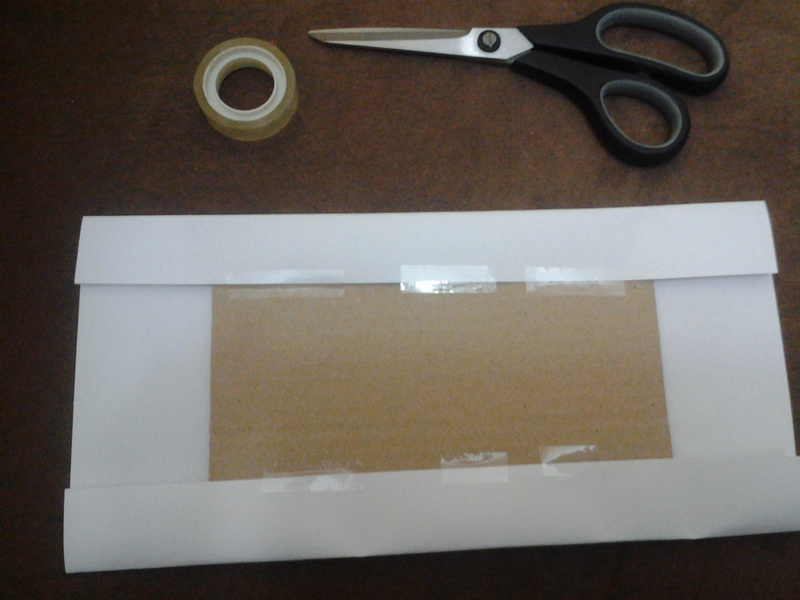 How to: DIY personalized greeting card..
Let me tell you this guys. 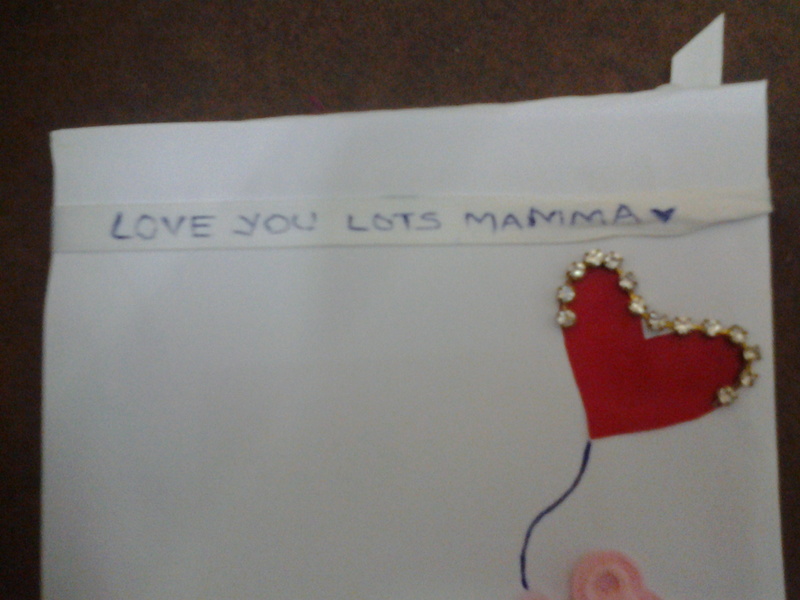 I LOVE getting personalized cards rather than an expensive card from Hallmark!. 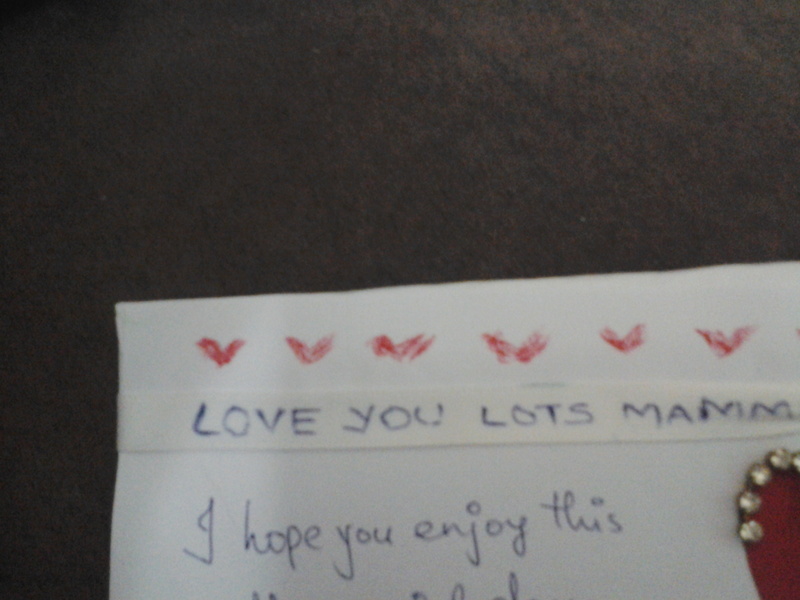 To know that someone actually put in some thought and effort into making a card for me, is a really special feeling. 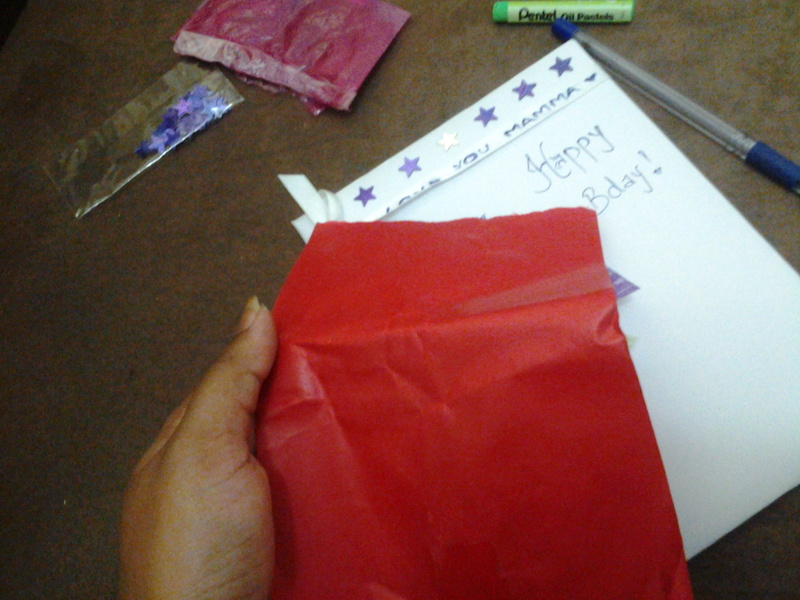 So I try my best to give personalized cards on my family and friends’ bdays. 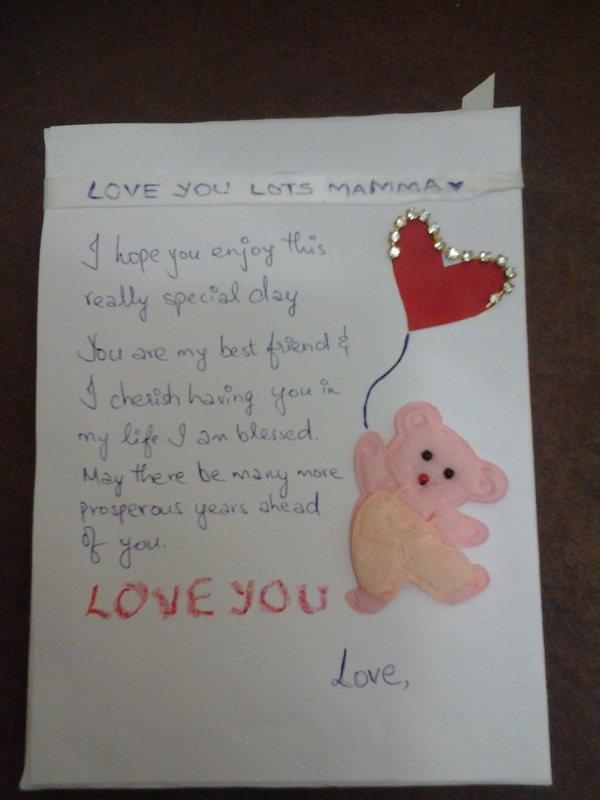 My mom’s bday is coming up and this time, I thought I will do a post on how I created one for her. First of all, in order to create a card, I don’t usually have the whole idea in my mind. 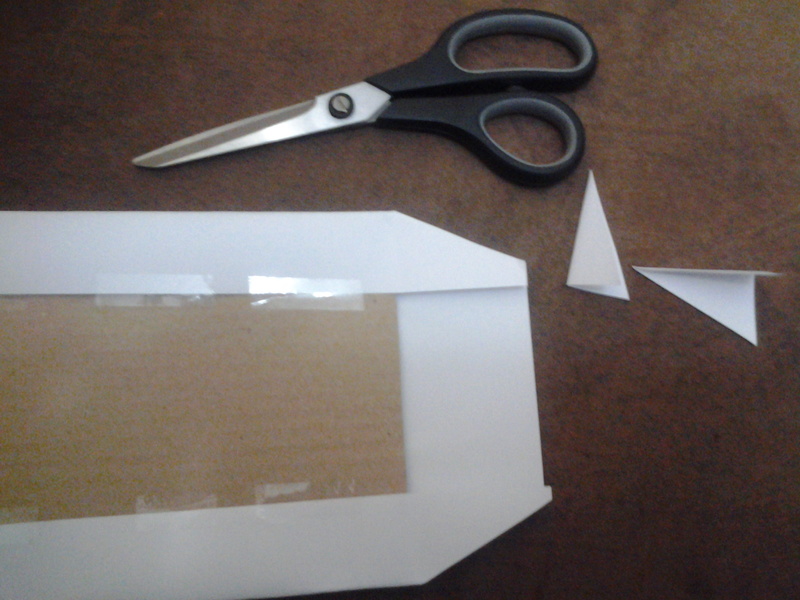 I just have a basic idea and then let it shape itself as I go on with it. You can simply get whatever decorative items you can and put it together to look pretty. I usually save certain things for future simply because I think it would come in handy some day. 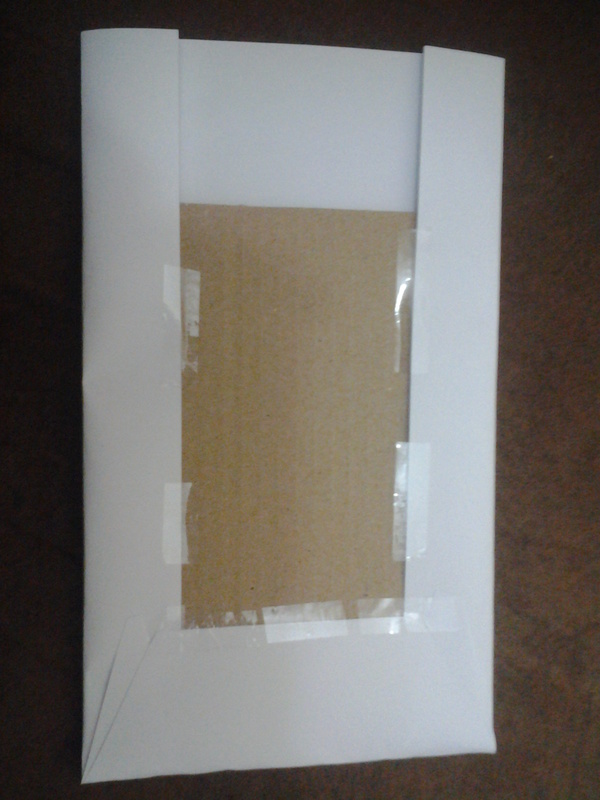 As you go through the post, you will know how much I am into up-cycling. Note: This post is loaded with pix because I wanted it to be completely detailed! 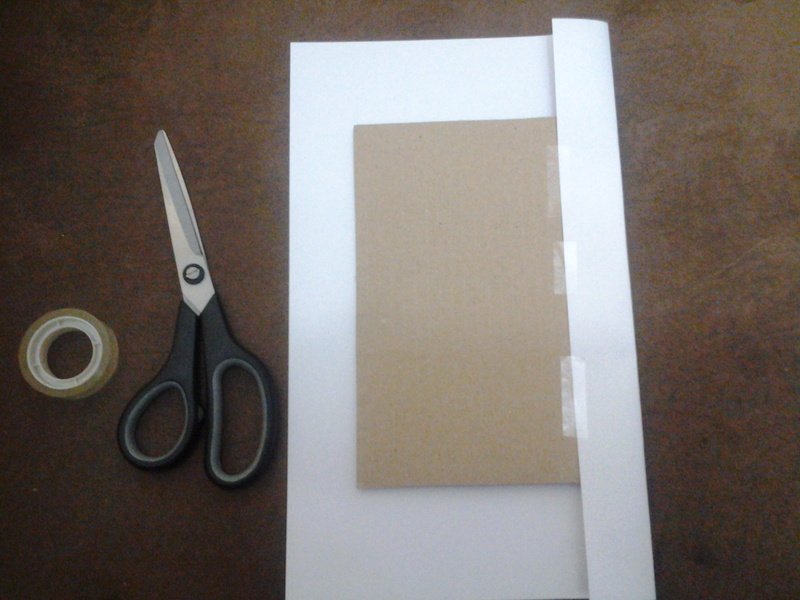 The basic idea I have is to cover that card board piece with the A4 sized paper so it becomes a thick card. 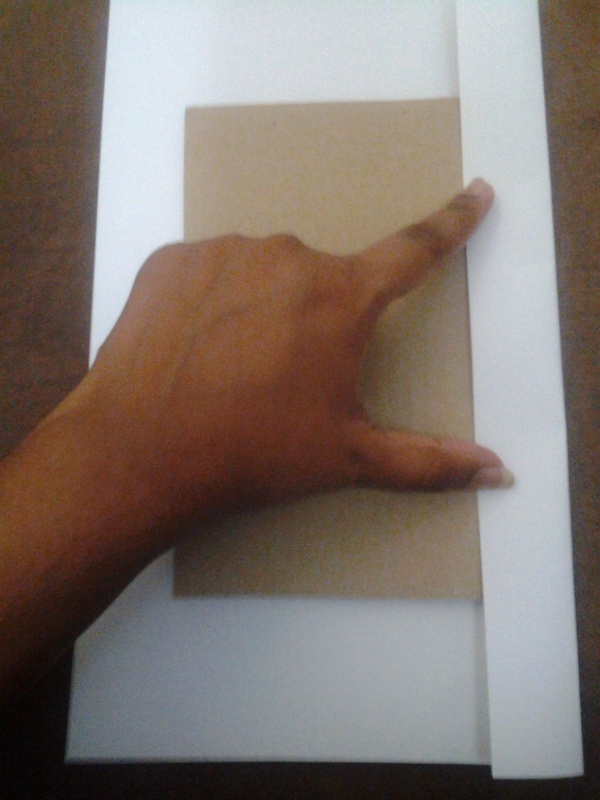 That card board piece is something I got from inside a new pillow case set. Ironically, that pillow cover set was gifted to me by my mom!. 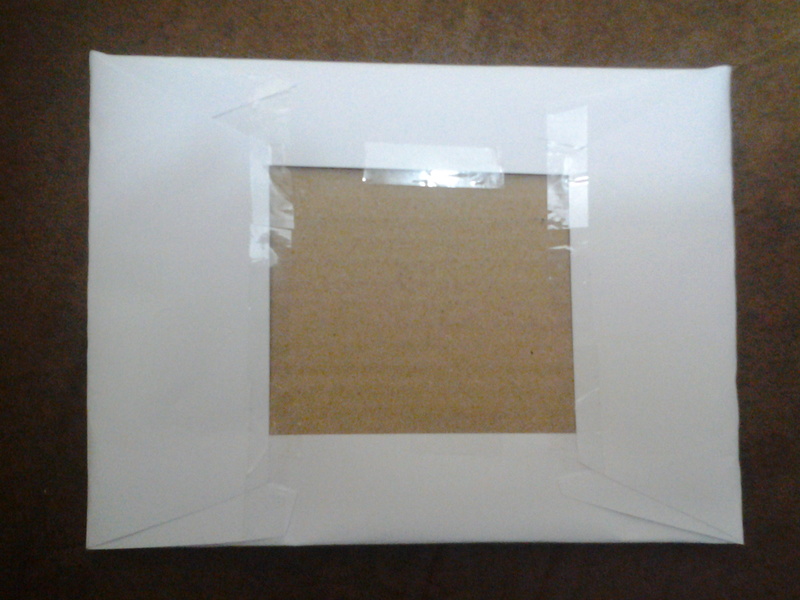 Now except for that tiny square in the middle, it’s completely covered. 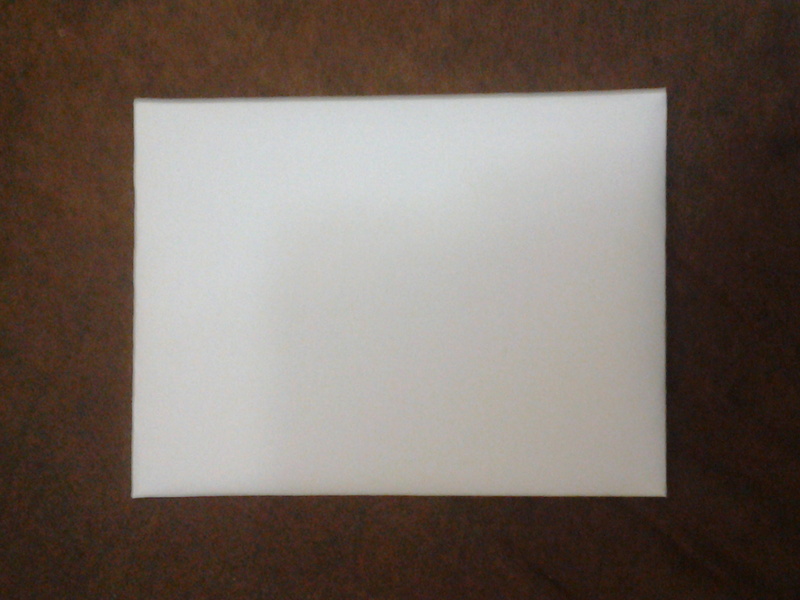 I took the second A4 sheet and cut out a piece (the size of the card not the size of the small square) and stuck it to this side. Now both sides are covered. 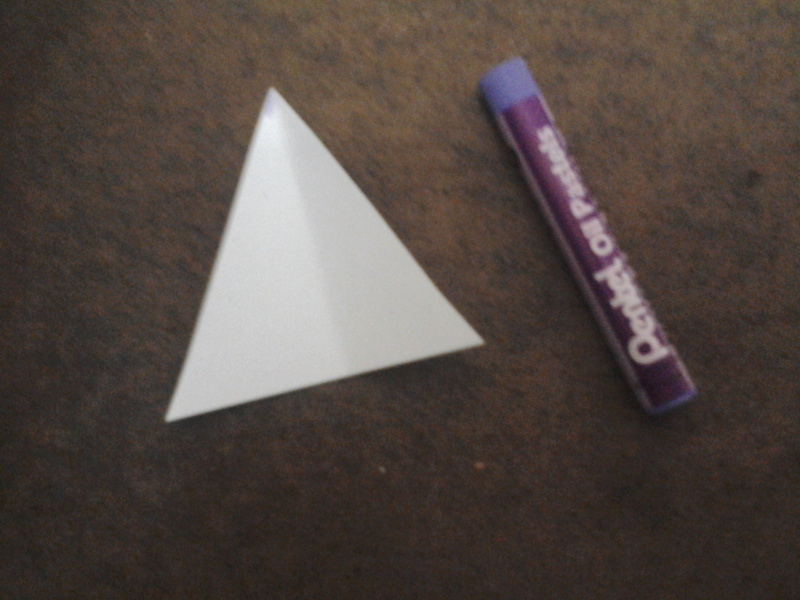 Remember those triangle paper pieces I saved? . I decided to color them. 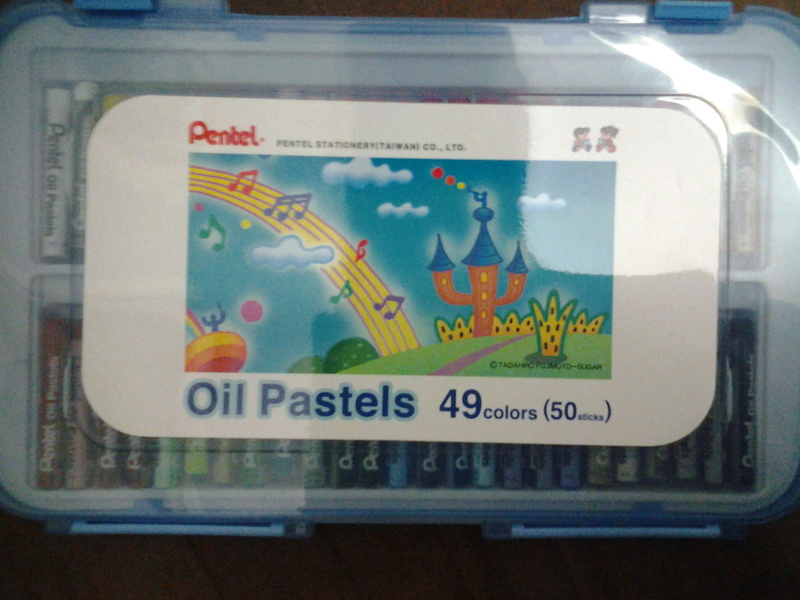 I used 5 of the oil pastel sticks from the set I have, in total for this card. 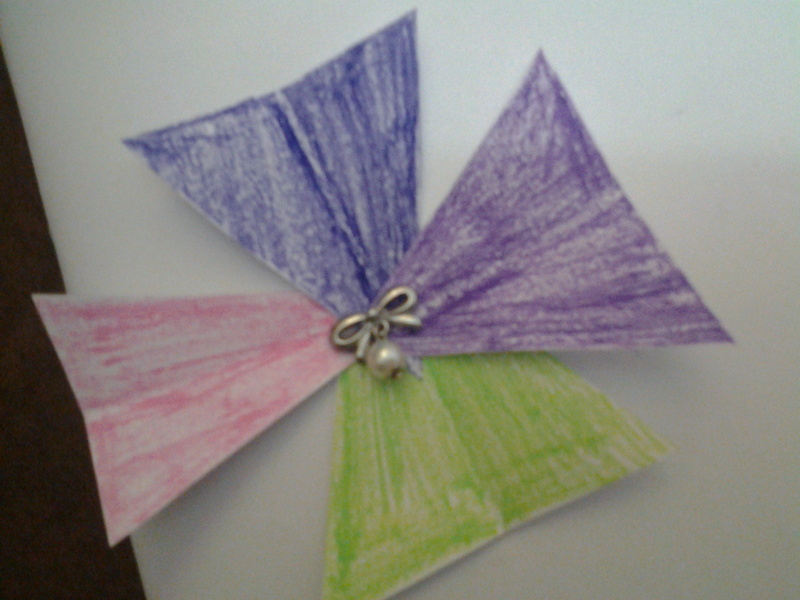 Violet, hyacinth violet, yellow green, pink and red are the colors I used. As you see, I hadn’t planned this before. It just hit me and I thought it would look good. 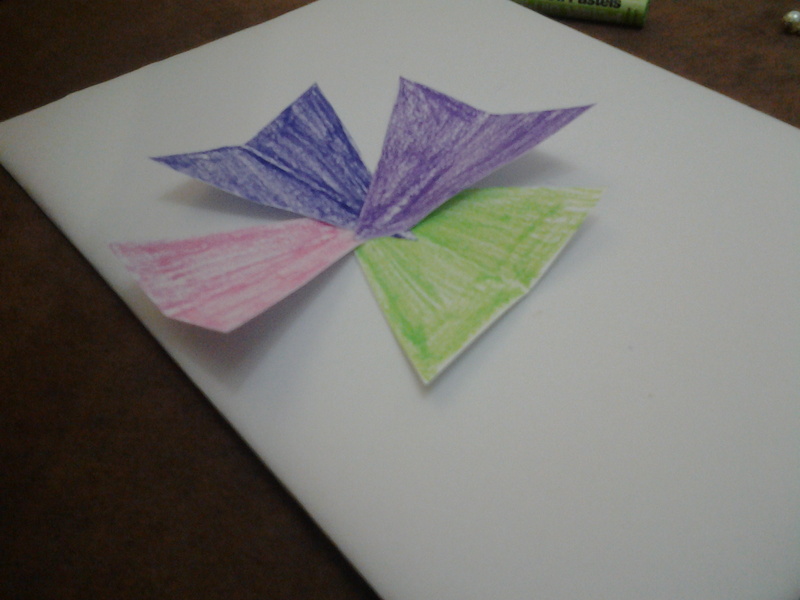 Next, I lifted the petal-like parts of the triangles so that it doesn’t lay flat against the card. 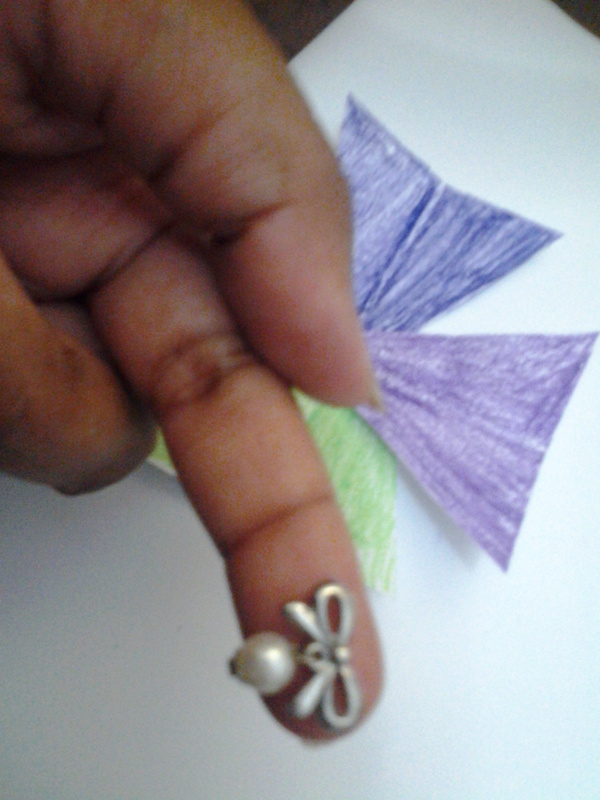 Here is a cute thing I saved from an earring I got from H & M.
I am guessing it will look good in the middle of the triangle structure. 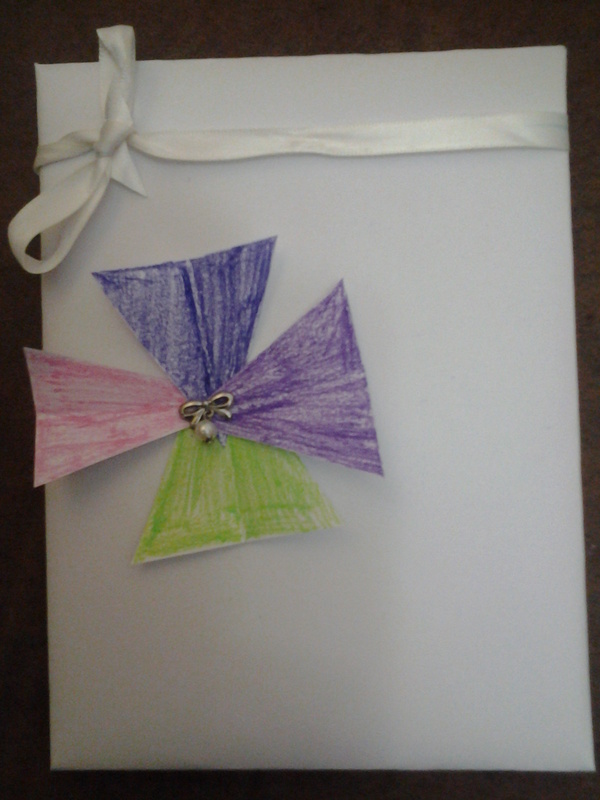 Next I tied the ribbon (which was wrapped around a small goodie bag I got some time back from Dove) on the top of the card. We will perfect that ribbon in a second!. 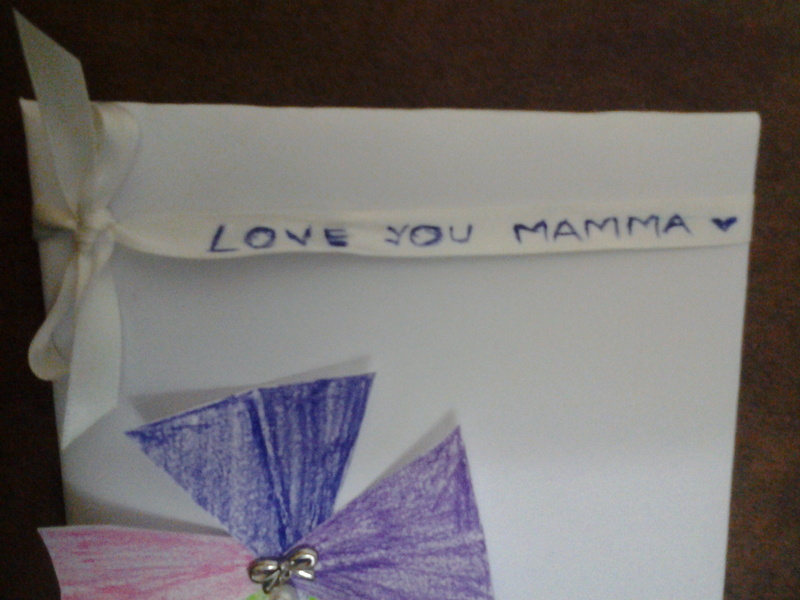 I then wrote a message on the ribbon. 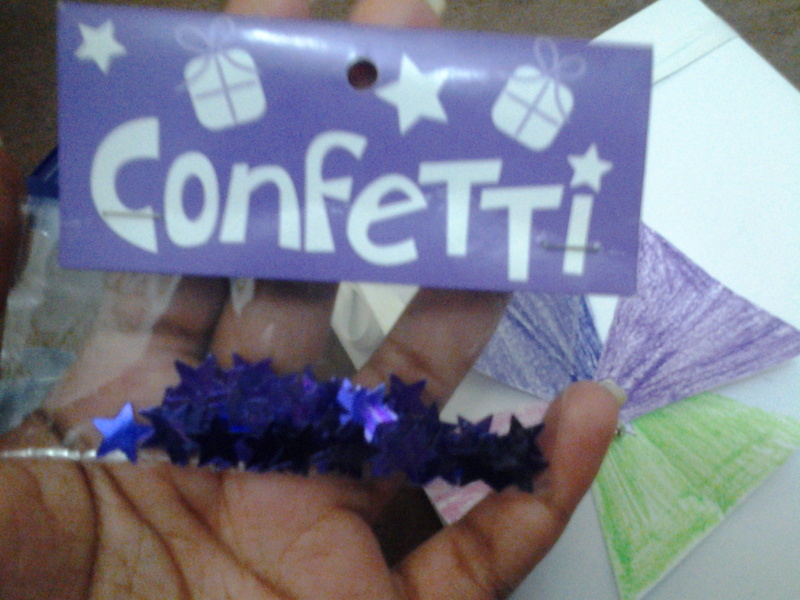 I then got a pack of confetti stars. It came along with a gift bag which I once got from some gift shop. 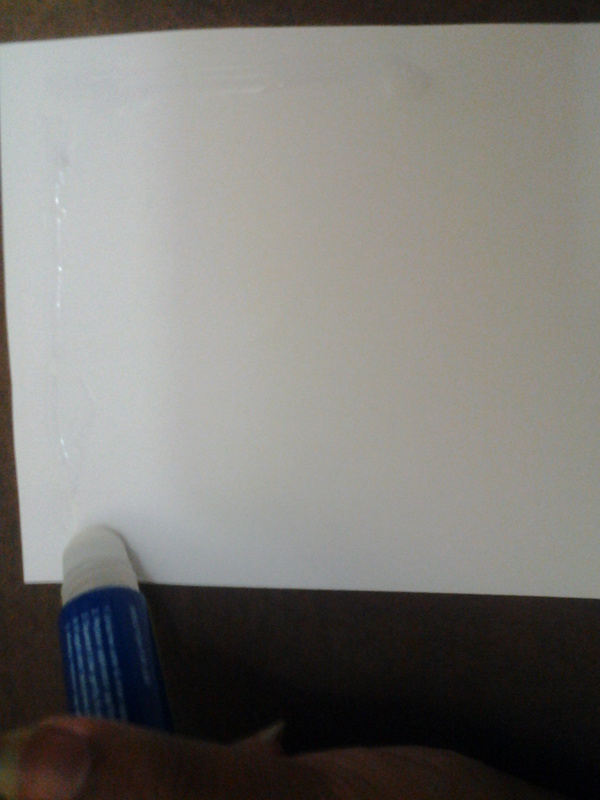 Then I stuck it to the top. 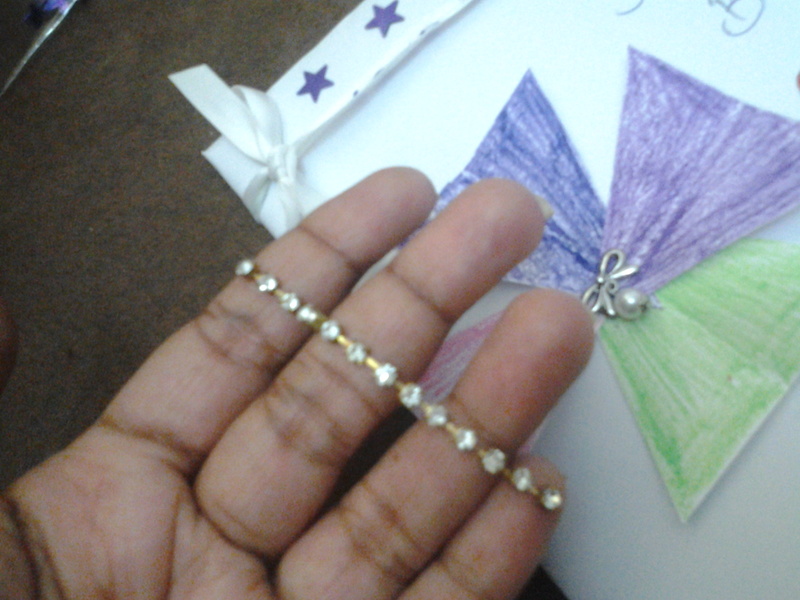 I found a single silver star among the bunch of purple stars!. So I put that in the very middle! 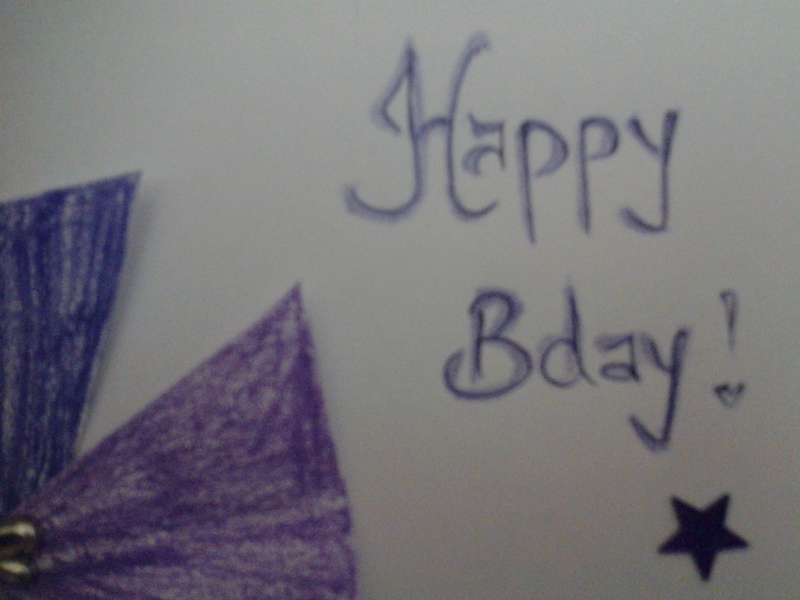 I wrote Happy bday. 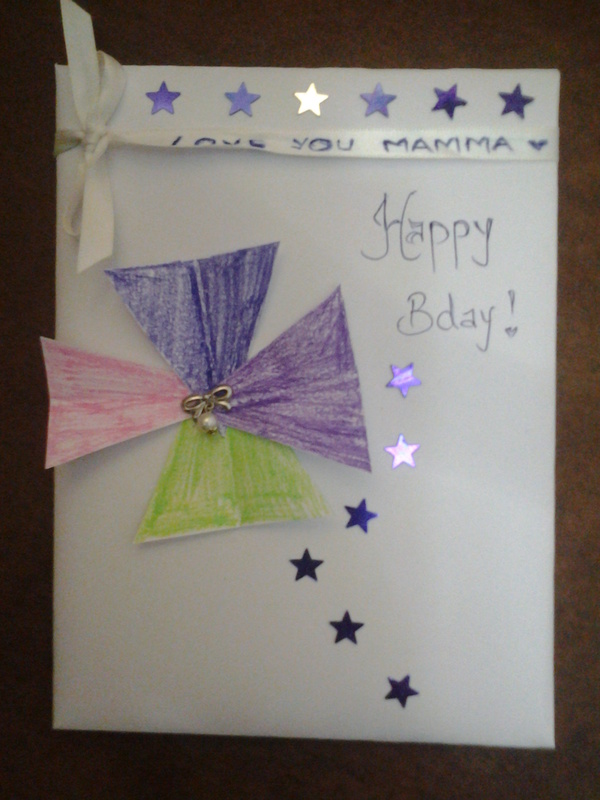 Then I arranged some stars on the bottom part of the card just to see how it looks. Two of the arrangements are shown below. However, those both aren’t the way I finally stuck it. 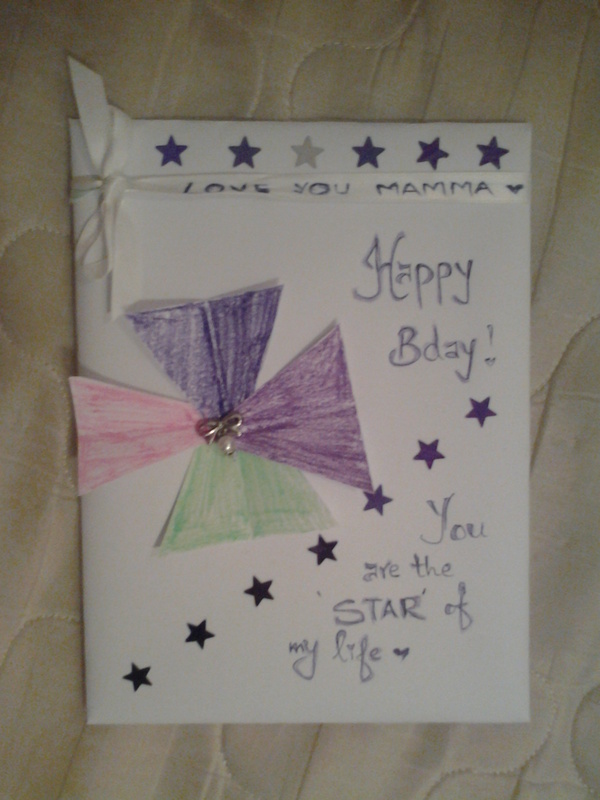 Here is how I finally did the stars and wrote a message for her. 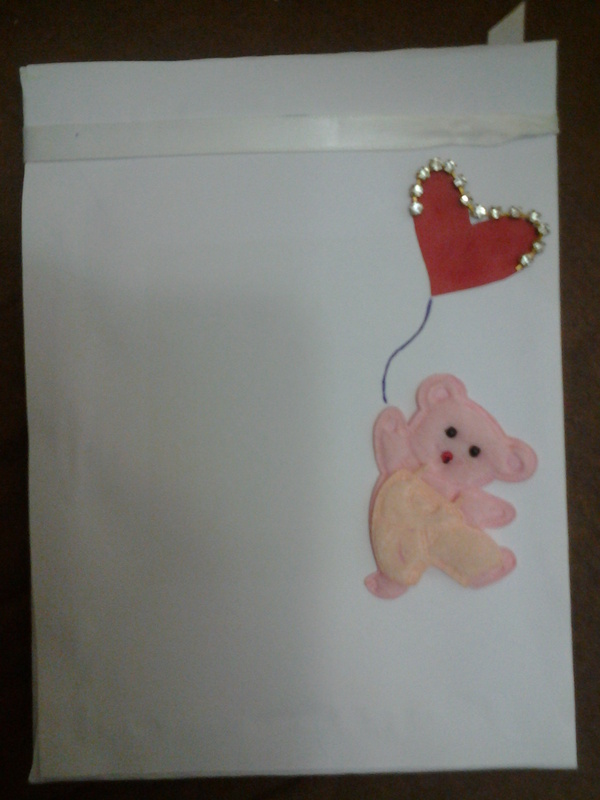 So the front side of the card is done. I kept the theme purple simply because the stars were purple. 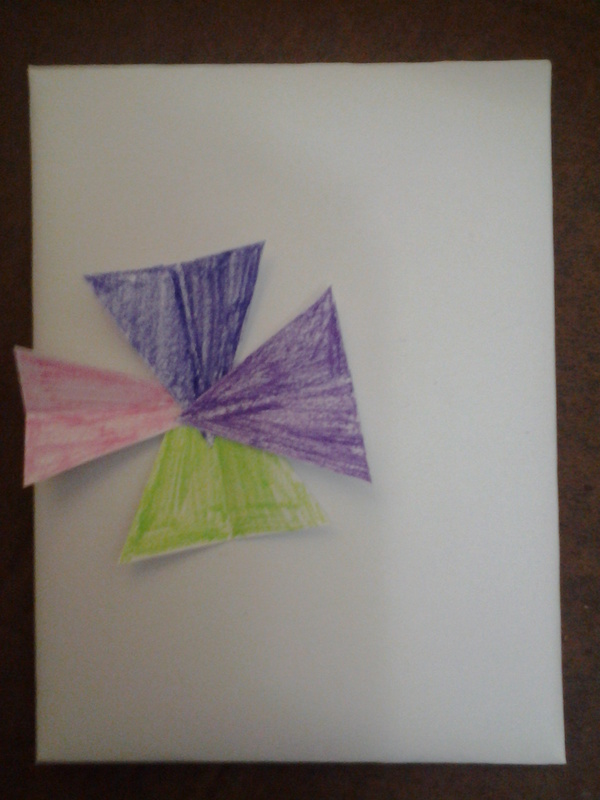 I brought in the green and pink simply to bring more color rather than the whole thing being monochromatic. 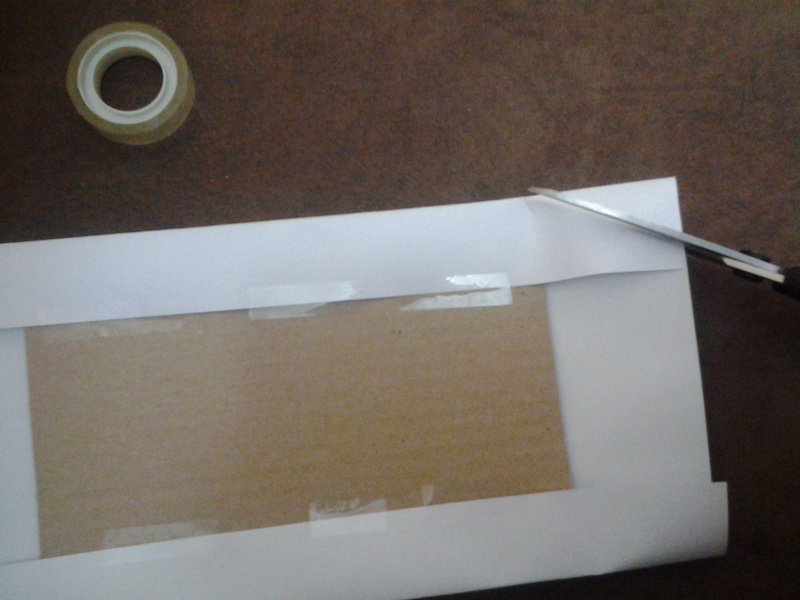 Now lets do the other side! 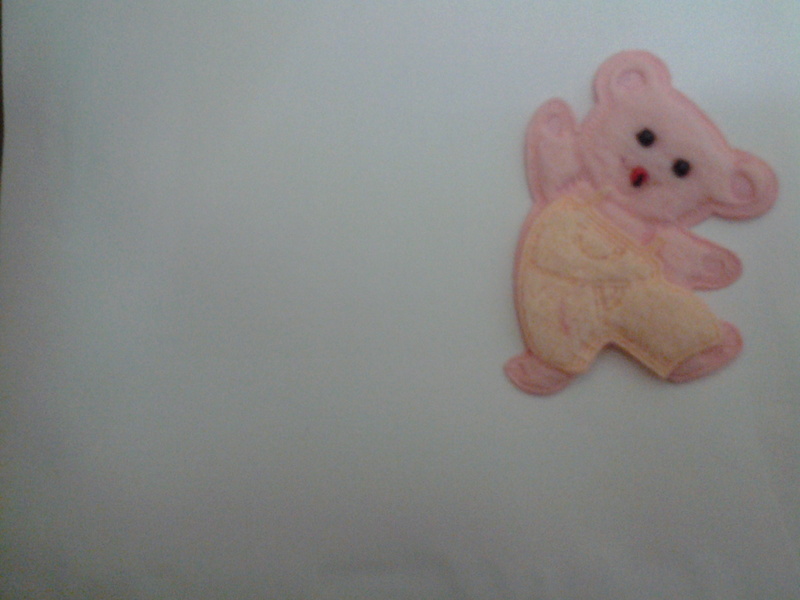 Here I thought of incorporating a teddy which came off my autograph book cover. It’s dress is really soft you know! Another idea hit me and I decided to keep that side of the card in a red theme. 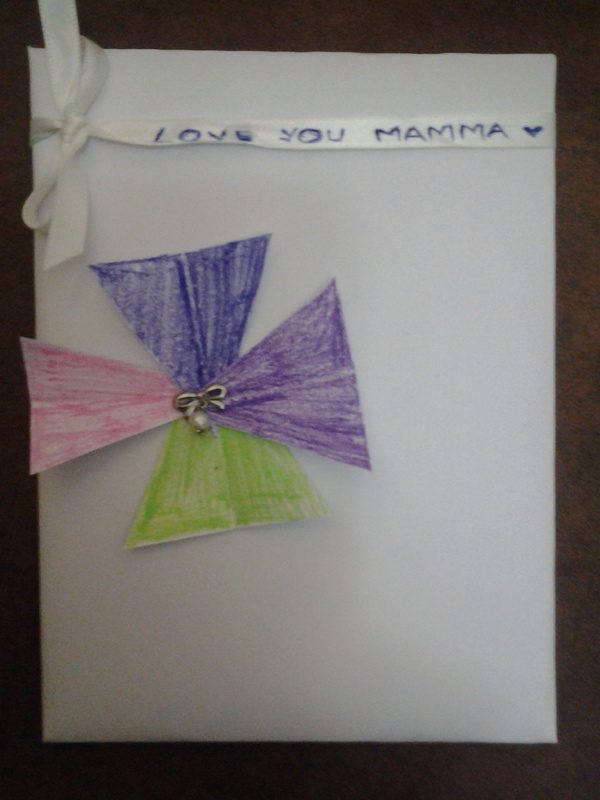 So I got this gift wrap which I once received from a friend. 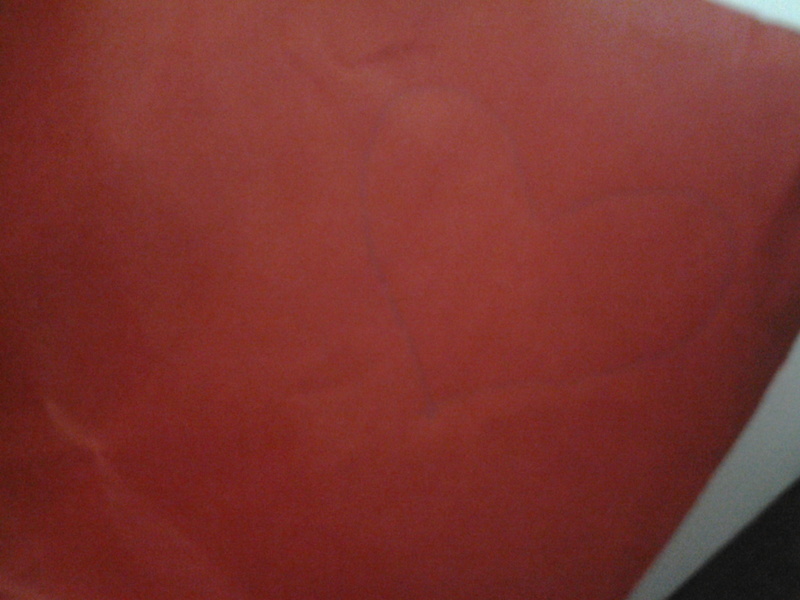 I drew a heart on it so I can easily cut it out. 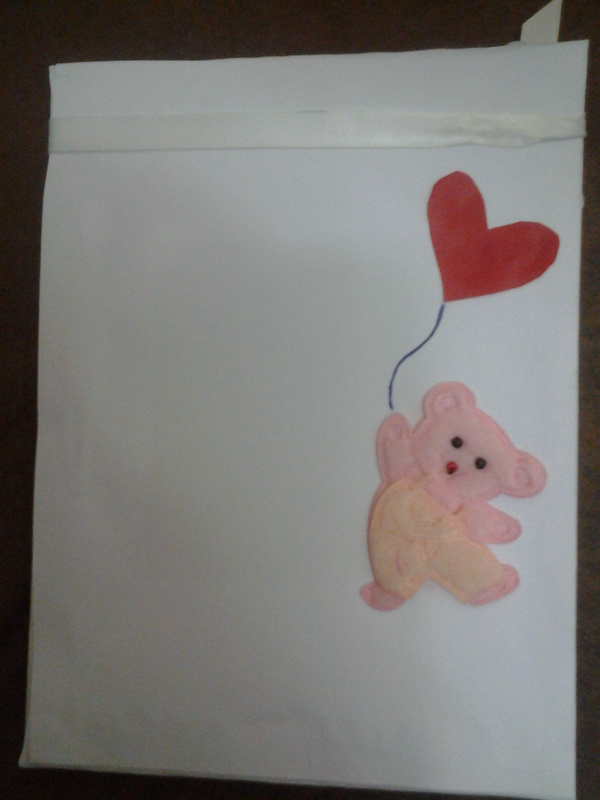 Below, I stuck it and drew a line to make it look like the teddy had a heart balloon. Hmm…. Lets make the heart a bit sparkly! 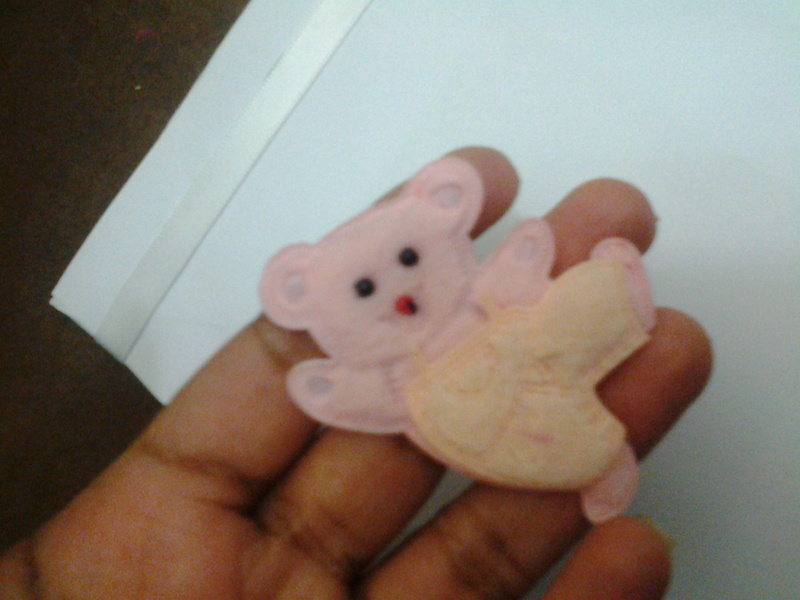 In the end, childish looking hearts on the top! Thus it’s complete. It’s not super creative, however, it’s thoughtful. 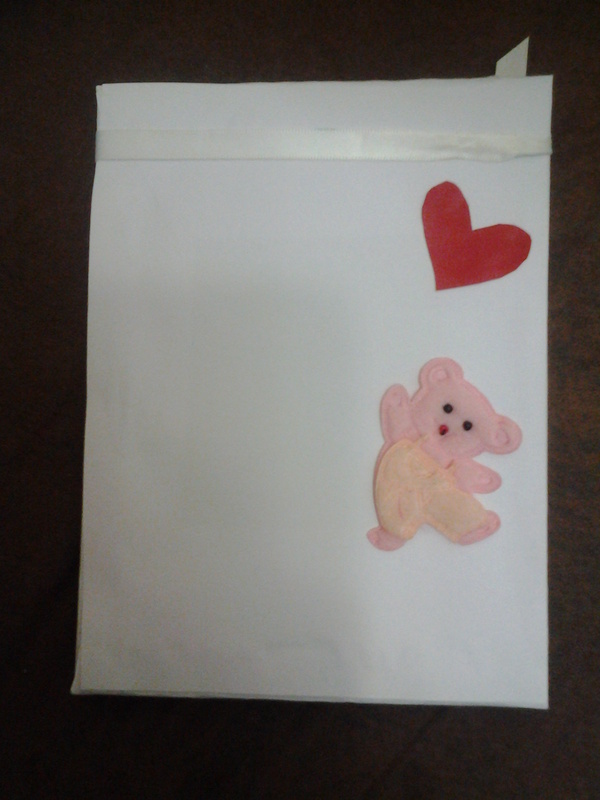 When making a card, you don’t have to make everything perfect. That is the beauty of it. It’s unique that way.. Let me know below whether you guys liked it and which side you liked more. 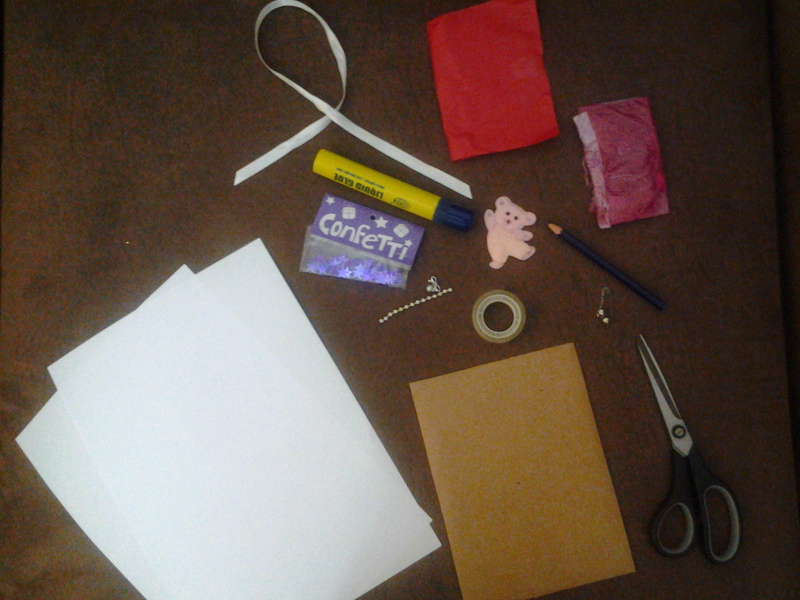 Do you like DIYs?. Comment below!